IT WAS devastating to learn that the Oldham Evening Chronicle had closed its doors last week. After almost 164 years of continuous publishing, millions of words, hundreds of controversies and stories, and the production of dozens of fine journalists, KPMG were swiftly appointed administrators of the firm last Thursday afternoon. At the time staff were unwittingly filing their stories, taking advert placements and making calls for a Friday morning edition that would sadly never see the light of day. Within an hour they were gathered together and told their fate – and that they did not even get the chance to write their own obituary edition seemed particularly cruel to me. They deserved that at least. I knew the paper had been having financial problems for some time – in particular with a pension deficit – but had always hoped that a solution to be found. Dave Whaley, the Editor, called in to confidentially update me on the issues just a few weeks earlier. Characteristically defiant and pragmatic about what might happen his chief thoughts, typically, were for the fate of all his 49 staff. Dave was, however, also deeply concerned about the impact the paper’s potential closure would have for Oldham – and he was right. I’ve seen some say on social media that Oldham Council will now be quietly rejoicing the Chronicle’s demise, but nothing could be further from the truth. Many people have already told me they cannot get their head around not being able to go and buy their ‘Chron’ and there is a genuine sense of loss that extends even to ex-pats who still looked forward to reading from afar. Local media has a vital connection to its people that provides an unmatched service to everyone. It is crucial for communities and democracy. Many Oldham residents will have appeared in its pages at one time or another and will still have a proud cutting gathering dust somewhere in their home. If you were on the wrong side of the law in court you could expect to be identified in the Chron. If you were fundraising in your community for a good cause you could expect to be supported by them. And you could expect to find out news from the families of long-lost friends, neighbours or relatives in the births, deaths and marriages pages. In recent years the Chronicle had also been a positive ambassador for Oldham as a place. It backed us as a council when we showed ambition, but it was also ready to give us very public criticism when we deserved it. We may have squirmed and fumed at the time, but that is the scrutiny that comes with local democracy and it is a deal that works. I sincerely hope a ‘Phoenix Chronicle’ may yet rise from the ashes, albeit likely in a weekly or bi-weekly form, and we will do anything we can to assist and encourage that to happen. Oldham as a town needs a newspaper so we will be keeping a keen eye on developments: not least because it’s also vital that other elements of the old Chronicle brand and products are not lost. The Pride in Oldham awards, for example, was a fantastic community event that highlighted the incredible contributions of ordinary people in a way that nothing else could. And let’s not forget the importance of the newspaper’s archive too. Thousands of plates, negatives and digital content are all there on Union Street telling the story of our town and they simply must not be lost. I know people are working hard behind the scenes to ensure it can be preserved and enjoyed for generations to come. Moving onto brighter news this week, I was delighted to open the EPIC Talks at the Your Oldham Festival in the Old Town Hall on Monday. It was inspiring to see important issues like inclusive growth and social contracts being discussed here in the heart of our town. There’s still chance to catch some fantastic events across the borough until Saturday, so please visit our website here and book your free place. On Saturday our exciting Oldham LIVE event will be taking place offering fun for all the family from Noon followed by established music artists from 6pm onwards. We’ve now updated our webpage with more detailed information – including site maps and FAQs – so please give it a visit here and support us. This is a pilot event designed to show that Oldham has an appetite for and can deliver top-quality events that re-establish it as a destination. Parliament Square is the place to be this Saturday – and it’s all completely free. Please come along, spread the word with your friends and neighbours, and help us to make it a day to remember. FESTIVALS aren’t something you might usually associate with Oldham, but that’s all changing this year. There have been some fantastic new local events this summer – including the Cotton Clouds music festival in Greenfield – and we’ve got many more exciting things to look forward to yet. First-up, we’re in the final throes of planning the Your Oldham festival which starts on Saturday, September 2. This is a weeklong festival celebrating all the great things about our borough with free family fun events. It’s now more than six years since we declared our ambition to become a Co-operative Council and working towards a Co-operative Future, which is one where everyone does their bit and everyone benefits. The Your Oldham festival is about looking at what we achieved so far and encouraging even more residents, businesses and staff to do #yourbit. #yourbit can be doing something really simple – like taking part in a litter pick, recycling smarter, checking on a vulnerable neighbour or even organising a street party where you live. But we can all make a contribution, big or small, that benefits us all. This campaign also reminds everyone that the borough is not owned by Oldham Council or its partners. It is owned by its most fantastic asset – you, our people. There’s a number of great family friendly events going at the Your Oldham Festival – all showcasing the great co-operative activities which go on daily. These range from an outdoor adventure day (Sunday, September 3 from Noon to 4pm) at Castleshaw Centre in Delph to a Co-operative Market Street in Oldham town centre (Wednesday, September 6 from 10am to 4pm), a Your Green Oldham day celebrating our environment and green spaces (Thursday, September 7 from 10.30am to 4.30pm), a Your Digital Roadshow at HACK Oldham (Friday, September 8 from 10am to 4pm) and Your Future, which imagines the borough of the future (Saturday, September 9 from 10am to 2pm). During the festival we’re also asking young people to write a ‘Dear Oldham’ letter telling us what their hopes are for the future. That could be about activities or facilities they want to see, or just simply what they want to be able to do here in years to come. The deadline to enter letters and drawings is Friday, August 26 and you can find out how to get yours submitted here. Winning letters and drawings will be published in a special booklet and on our social media channels. The final day of the Your Oldham festival also coincides with the fantastic Oldham LIVE event which we recently announced. This is a spectacular new free entertainment and music festival to be hosted in Parliament Square and is unlike anything we’ve ever put on in Oldham before. If you’ve not already heard, it will feature pirate-themed fun for families and kids during the day from Noon until 4pm – all led by kids’ favourite Gemma Hunt from CBeebies’ Swashbuckle. Live music will then take centre stage from 6pm onwards with a line-up headlined by The Farm, plus Stooshe, Kelly Llorenna (featured artist on N-Trance hit ‘Set You Free’), a Clint Boon DJ set and Nathan from Brother Beyond – all bands and names which should be familiar to many of you. In next week’s blog I’ll be explaining more about our plans for this event and outlining the arrangements we’re putting in place to make this a fantastic day for everyone to remember. In the meantime, you can find out more about it on our website here – including a video playlist of the artists appearing at Oldham LIVE, plus information about transport, and where to eat and drink. The opening of the Old Town Hall last Friday was every bit as exciting as I had hoped it would be and I was honoured to carry out the official opening, alongside former council Leader, MP for Oldham West and Royton, Jim McMahon. Hundreds of people made the special journey to Oldham town centre to witness the free show ‘On the Shoulders of Giants’ and were both entranced and delighted with the bravery of the aerial acrobats who helped to bring the story to life. The story epitomizes what we are about – a small girl who, when raised on the shoulders of a giant, finds that she can see much further – and that she can also see a brighter future for herself and her town. Well I see a brighter future for our town and truly believe that this development marks a new era for Oldham. I was heartened to see so many people at the event. So many of you gave up your Friday night to join us in celebrating this new start for Oldham town centre, so it just goes to show what a huge difference this development has already begun to make to our town. 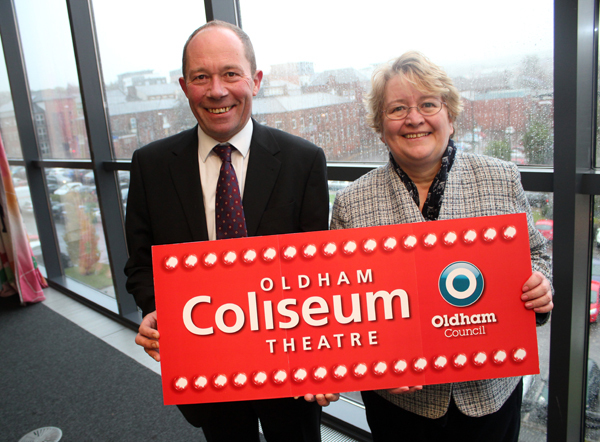 As I said on the night, this is a game-changer for Oldham – and it really is just the start. Work will continue over the next few weeks to progress the phased opening of the restaurants and I will continue to keep you updated on this as it happens. Finally, as promised a fortnight ago, I’m going to explain the final two priorities that lie ahead for this administration. Both are about health and wellbeing. We will work hard to manage our budget so we can continue to provide care for all who need it – and for Oldham to be a caring place to live. That’s not easy given the challenges we’re facing with our budget, falling income and rising demand, but it’s a commitment that remains: from our new Right Start service right up to helping people live independently in their homes or managed accommodation in later life. That agenda is increasingly about reforming public services, delivering things in a different way with partners, and empowering individuals to help themselves. The partnership model behind Warm Homes Oldham is a great example of that – as is the Early Help scheme which has redesigned and integrated services for people who need support with problems like drug and alcohol addictions, mental health issues, school attendance and behaviour, and housing. A vital final priority for us is to support healthy lifestyles. We’re actively helping residents and staff to be ‘Fit for Oldham’ – mentally and physically – and there are many aspects to that. I think of our brilliant catering team who offer the healthiest school meals in the North West to give our children a great start are a perfect example of that. We’ve also got fantastic parks and open spaces like Alexandra and Dunwood Parks to enjoy and get active – and we’re continuing to invest in others, like the new MUGA pitch at Coalshaw Green Park. With partners and volunteers we also offer a wide range of help and activities, like the fantastic local Parkruns, and we now have a modern estate of leisure centres. Through a host of other measures like growing hubs, fruit routes, allotments and schemes across the borough – like those at Lees, Alexandra Park and community projects like those with the Firwood and District Residents’ Association and the Fatima Womens’ Association – we’re widening access to healthy food, knowledge and fitness. And we’re doing all that from juniors upwards to help these become habits for the next generation. The rationale is that this is ‘win win’ for everyone, if we get this right. It’s not just beneficial for those families taking part, it will also ultimately save the public sector money. We can only build a better borough together. OLDHAM’S skyline and environment are changing fast – and the best is yet to come. That transformation has been steadily accelerating since the opening of our town centre Metrolink line in 2014. Walking around Oldham now you can’t fail to notice many new or improved buildings, plus new views and vistas, and the green shoots needed to improve our local economy. You can see it clearly in areas like the Independent Quarter – where we are co-investing with people putting their life savings, daily graft and faith into breathing new life into the area – and it is steadily being replicated across the town centre. The Old Town Hall is, of course, the flagship project and it’s already become a tourist attraction in its own right. Every day you see people stopping to stand around the Cenotaph and the Greaves Arms sneaking a peek at the site and taking snapshots. Although you cannot yet see inside the grand old building, I can confirm that work is well advanced and we now have a provisional handover date from our contractors. Following that there will then be a ‘fit out’ period when the new tenants’ own contractors move into the units to install their own fittings and train staff. I can’t yet confirm the opening date publicly but your new ODEON cinema and restaurants remain on track to open later this year. And it was great this week – before we’ve even opened the doors – to see the Old Town Hall scheme nominated for a major award. The GM Chamber of Commerce has shortlisted it for ‘Building of the Year 2016’ and that’s a promising early indication of the kind of impact we’re expecting from a new regional destination that will put us firmly on the map. If you can’t wait to glimpse that future then I’d recommend a visit to the new ‘Revival’ exhibition which opened at Gallery Oldham this week. This looks at the Old Town Hall and the iconic old Library and Art Gallery building, which will become our new Heritage Centre, showcasing images and objects belonging to both as they are adapted for their new future uses. Looking at that Old Town Hall site you can also see work is progressing well on Parliament Square, our new public space, and other much-needed improvements being made to the surroundings of the Yorkshire Street/Union Street area. This will see better highways and pedestrian areas and an improved cycle infrastructure leading into the town centre. That will make a significant difference to the appearance of that area, which will also be boosted by the new-build three-form academy primary school set to open at the former Grange School site in September. Just down the road from there I had the honour of attending the official groundbreaking ceremony for Maggie’s Cancer Care Centre at Royal Oldham Hospital on Monday. This will provide a fantastic place offering free practical and emotional support in an environment that will make a huge difference to the quality of care for local patients. The plans show it set in a sloping garden with trees growing up through the buildings – accessed over a bridge – with views down to a garden pool. It’s just the latest life-changing project to be funded by the generosity of the Stoller Charitable Trust. But what goes up must also come down – and that’s another way in which regeneration is changing the skyline. Earlier this year we pulled down the former Oldham Sports Centre on Lord Street which means residents on the new St Mary’s Estate (for now at least) can enjoy a more splendid view of Oldham Parish Church. A couple of weeks ago I also pressed the button to demolish the seven-storey council-owned car park at Hobson Street which, let’s face it, has been an eyesore for many years and its demise clears that site again for a brighter future. This was a cold, brutalist structure which, like the old St Peter’s Shopping Precinct (or ‘Windy City’ as many of us called it!) will surely not be missed by even the most nostalgic of residents. In looking positively to the future like this, I’m also very conscious that we’re living in incredibly uncertain times. The UK is in a difficult and challenging environment on so many levels at present and, as a mere Council Leader, I don’t for one moment pretend to have a crystal ball about what that lies ahead. What I do know, however, is that having a long-term regeneration plan – both physical and social – is crucial to anchoring your confidence (and that of others) in your place and its ability to improve people’s prospects. These latest signs of progress in Oldham’s skyline and environment show that we have that plan. Without it we would surely be exposing ourselves to even greater uncertainty. This is my final blog now before the traditional Council recess break, but it will return on August 24. Many of you will have holidays planned soon, so I hope you all enjoy fine family times and weather – and stay safe. YOU’VE PROBABLY read by now about plans for a new waste collection system to be introduced across the borough in early October. Put simply, it means a move from two-weekly to three-weekly collections of your grey, general waste bins – plus other measures to help people recycle. I must stress that we haven’t done this lightly – and also that we did our research first. I know kerbside collection is the one service that every single resident relies upon. That means making changes to it is a big deal and that we must get it right. After weighing up all the options the decision boiled down to some inescapable facts. At present, the cost to Oldham Council for disposing of grey bin waste comes to hundreds of pounds per tonne. Yet for every tonne we recycle, we actually get a small income. That means our future simply has to be about less waste and more recycling – which are environmental and economic ‘wins’ for everyone. The more money that we can save by doing this, the more funds we can then put back into protecting vital frontline services as Government continues to slash our funding. We’re not unusual in making this change. Across Greater Manchester there is now only Wigan that still has fortnightly collections of the standard 240-litre grey wheelie bins. Other authorities have all either introduced three-weekly collections – or moved to 140-litre versions of the general waste (grey) bins, which are 40 per cent smaller than the standard containers. By not changing bin sizes we don’t have to spend money on replacing all your bins, which is a considerable cost. It’s been reported that Manchester’s switch to slimmer bins, for example, will cost them around £1.8m. We’ve also looked closely at how three-weekly collections are working in other areas. Bury were the first to introduce them and faced a storm of national headlines about fears of overflowing bins and infestations of rats and insects. In the first year of the new scheme thousands of tonnes of general waste – a drop of 16 per cent – were no longer sent to landfill. Bury’s recycling rate jumped by nine per cent and they saved hundreds of thousands of pounds. In Oldham we estimate we can increase our recycling rate by 12 per cent through these changes which – over the next two years – would save us up to £3 million during a time when we need to find £37 million in savings. I’ve heard it said this move will lead to a more flytipping here, and I understand that concern. However, our experience with flytipping – as detailed in my blog two weeks ago – is that the majority of it isn’t down to selfish residents. It’s lazy trade waste discarded to avoid costs/responsibility, and bad landlords dumping items left by departed tenants. The new collection regime will be a simpler one. Grey bins for general rubbish will be collected one week. Blue bins for paper and card the week after, and then brown bins for glass, plastic and tins in the third week. We’ll also continue collecting all garden and food waste on a weekly basis. That’s to stop the potential for bad smells and flies/insects, especially during the summer. Households with extra waste they cannot recycle could be entitled to an extra grey bin and they should contact us to discuss the options. And we’re also offering – free – any extra blue, brown and green recycling bins you need, or upgrades to bigger recycling bins if you have the smaller ones. Before the new system starts I’ve been very clear that we must contact every resident with information packs that explain your options and help with the changes. Those will include new collection calendars, plus information about how to recycle more effectively. I’m sure the Stretton household isn’t alone in having had many debates about what can and can not be recycled, and exactly how(!). You can read about the new arrangements on our website at www.oldham.gov.uk/waste or find out more by calling 0161 770 6644. Change brings challenges and I can moan as much as the next person when asked to do something a different way after years of habit. But we also know doing things differently is our best chance to help find the savings we need to provide good services here. For now all I ask is that you give the new arrangements ‘a go’ as others have elsewhere. Please do ‘your bit’ and get behind our mission to recycle as much as we possibly can. ‘Our bit’ is a pledge to monitor this scheme. We will test how it is working on an ongoing basis and, if something is wrong, we will try to fix it. Together we can make this work for Oldham. I WONDER what Harold Wilson – the PM who coined the phrase “a week is a long time in politics” – would have thought about the last few days. The EU Referendum last Thursday has sent the UK into a tailspin and its impact is being felt across every walk of life and community. It’s been an unprecedented and extraordinary time – with things happening at such breakneck speed that you can barely dare to take your eyes off the news. I reflected last Friday night how tumultuous the times are when the Prime Minister’s resignation is not even the lead story on the TV news. The frenzy of resignations, shifts in stance, fluctuating financial graphs and political horse-trading has been dizzying – and it is far from over yet. As this is an apolitical blog it’s not the appropriate place for me to address my feelings about the rights and wrongs of either the Remain or Leave cases in the referendum. Nonetheless I do want to make some general observations about the campaign which apply to both sides because, at times, it was an unedifying spectacle. The debate was often heated, misleading and negative. The language was often aggressive, barking and divisive. I’ve heard many people on either side refer to “scaremongering” and that is something we should all be very worried about. That simply fosters distrust for politicians, important institutions and, worst of all, disrespect for other peoples’ views. I still believe the public is capable of weighing up a rational argument with the facts laid out fairly before them, but that isn’t really what happened is it? When people are saying days after the result that they now regret how they voted, that they were oblivious to certain consequences, or that they now feel like the final outcome will not be what they were promised, then we have surely failed to deliver a mature and informed debate. This referendum was the most serious decision of our time yet it was conducted in an atmosphere that was consistently adversarial. It was yah-boo politics at its worst and that has continued since the result came in. Exaggeration, hyperbole and speculation poisoned the atmosphere and that impacted negatively on voters too. And I do think that the sensationalist tone used for several months by some elements in the media around the issues also helped to create that climate. People got actively involved and interested in the debate, which is all too rare. You could not walk through a shop, café or street without hearing people talking about the issues – and that led to the biggest turnout in history last Thursday. The challenge for politicians on all sides next is to try and maintain that level of interest and engagement – although that will not be easy given the mistrust that has been stimulated. Following the result we have, regrettably, seen some instances of hate crime – although thankfully none have yet been reported in Oldham, and I hope that prevails. This frenzied national climate has raised tensions and anxieties within and between communities. I was shocked yesterday to see the footage of the vile racist abuse hurled by youths on a tram at Market Street in Manchester. That kind of behaviour has no place in our society and we will not tolerate hate crime here. We didn’t tolerate it before the referendum and we won’t tolerate it now. Whatever individual decisions people took we have to respect that and not jump to misguided conclusions about their motivations. We have to respect the vote and the decision. And we should also bear in mind the uncertainty this has created for many people, like EU nationals who currently live here. It’s bad enough for people having to cope with the uncertainty that all this brings – imagine your own family having to cope with that – but to be facing such ignorance in the places where you live and work is completely unacceptable. I would urge anyone who experiences or witnesses hate crime like this to report it immediately to the police by dialling 101 – or contact the independent charity Crimestoppers anonymously on 0800 555 111. We all now await the triggering of Article 50, the ‘sandtimer’ that starts exit negotiations with the EU, and then there is at least two years of those talks to endure. Ultimately it will be for the Government negotiators to agree those deals and clarify the long term impact on people. However, the impacts of Brexit are likely to be felt for a very long time by us all – whatever happens next. This period of uncertainty will mean further challenges to the national economy and that obviously raises the prospect of more cuts to public services that are already decimated – plus questions about where this all leaves the so-called ‘Northern Powerhouse’ project and others. I don’t have a crystal ball and I have no idea how all these pieces will fall at present. My focus, as always, will be to continue standing up for the people, communities and interests of Oldham to ensure we are not big losers from the fallout. Following last week’s result there was much talk about the links between deprivation, cuts to public services and the alienation of communities. None of us should forget that. National Government now – and in the future – must not repeat the mistakes of the past. FLYTIPPING IS the scourge of our communities – it’s bad for people and places. The photographs you can see on this page are of the thoroughly-depressing scene that I visited last week. Although I am Council Leader, I remain a ward member and am still always there to look after Hollinwood matters alongside my colleagues, Councillors Steve Williams and Brian Ames. A local resident came to see me and told me about this carnage, just behind the cemetery off Limeside Road, last Friday afternoon. When I got there I was shocked at the scale of the mess. A picture says a thousand words and, honestly, how do people look at themselves in the mirror after doing something like this? I’m told it seems to have happened between 9.30am and 3.30pm last Wednesday – so it was in broad daylight and utterly shameless. I rolled my sleeves up and started to sift through the mess on the site. There was what looks like removed render and other builders’ rubble and lots of bags – including some which contained what appeared to be stripped wallpaper. The way it was all strewn along the floor in a trail (pictured) suggests it was on the back of a flatbed truck. They probably just dropped the guard at the back and then drove off at speed to dump it. The contents this time appear to be trade waste but we also often find flytipping to be the result of another eviction by a rogue landlord. Either way, there’s simply no excuse. In and amongst the filth and debris I finally located what I was hoping to find: tell-tale signs of where the rubbish might have originated from. There was a letter and a slip containing two separate addresses of people with the same surname. Coincidence? Time – and our investigation – will tell. I photographed these and reported everything to council officers who then swung into action and got on investigating the matter. Our environmental services and enforcement staff do a great job in cleaning up scenes like this on a regular basis but it’s a thankless and disheartening task. They also work very hard to find the people responsible by looking for evidence of the original owner of the dumped items. In May this year all local authorities were given greater powers to tackle flytipping crime by now being able to issue penalty notices of between £150 and £400 to those caught in the act of dumping anything from old fridges or sofas to garden waste or rubble. The maximum fine for dumping waste has also been bumped up to £3m for companies and up to £95,000 for individuals. Even low-level offenders could face a bill of up to £10,000 and three years in jail. Crime like this – and that’s exactly what it is – costs our economy and you, the Council Taxpayer, millions of pounds each year. It also undermines legitimate business, and poses serious risks to the environment because it doesn’t just blight the area, it attracts vermin and is a health hazard. For me, actions speak louder than words. If you flytip it speaks volumes about you: about your outlook and attitude to society. Dumping your waste by the road, whether that’s in an alleyway, the countryside or a random industrial estate, is about as selfish as you can get. That’s why Oldham Council will have absolutely no qualms about using those new powers to punish anyone caught doing this. These ‘on the spot’ fixed penalty notices could also save us time and money in punishing offenders as they are a much quicker alternative to prosecuting through the courts. We’ll also continue to prosecute whenever we have sufficient evidence – and continue working closely with neighbouring authorities to jointly pursue cases that are happening across our borders. The money we spend on clearing up mess like this could be saved and spent on other vital services that people rely on. In the current financial climate this simply cannot continue. We rely on the public’s help in reporting flytipping and helping us to identify the people responsible. Please do your bit and let us know whenever you spot flytipping – or have information about it – by calling us on 0161 770 2244 or reporting it online here. To end on a much happier note this week, I just want to say congratulations to Carolyn Wilkins. Our Chief Executive was awarded the OBE in the Queen’s 90th Birthday Honours List last weekend and it was fully deserved. It’s an accolade that highlights her brilliant work and long-standing service to Local Government and Public Service Reform. It’s also yet another positive reflection on the way that people are starting to recognise the great progress that is being made here in Oldham. I’m very proud to work alongside Carolyn and also to be able to consider her as a valued friend. I’m sure all who know her across and beyond our borough will join me in congratulating her on this news.